What Does The Apple Logo Mean? The Apple logo has Biblical roots. Apple products are ubiquitous in our homes – and that means that the brand’s simple, elegant apple icon is a part of our daily lives. But what does it mean? Today we’ll take a look at the Apple logo meaning and the history of its loaded symbolism. Here’s how I used to explain the Apple logo meaning when I taught an art class for teenagers. “It’s an apple,” they’d reply. “Are there any other stories with an apple?” I’d ask, leading them another step back. This time, there were usually two moments of silence. Sometimes I’d have to nudge them with a clue (“Maybe an older story?”). Eventually, someone would shout, “The Bible!” Cue the astounded chorus of woaaahhh. In the Bible, Adam and Eve are tempted, by Satan, to taste the fruit from the tree of knowledge. Eve, like Snow White, gives in to temptation and takes a bite of an apple. 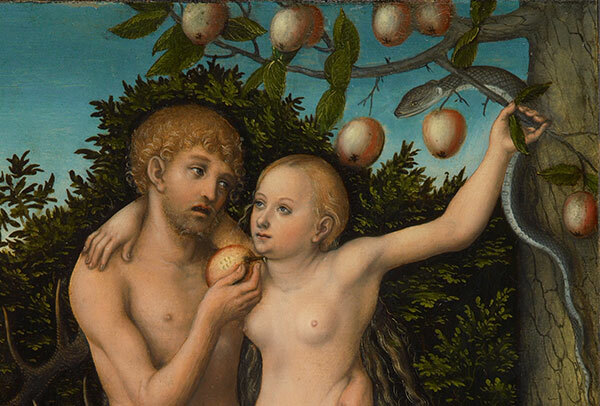 Once Adam and Eve had their first taste of knowledge, they knew that they were naked, and they were ashamed. That first bite of the apple represents the fall of man. The apple symbol – and the Apple computers logo – symbolizes knowledge. This symbol is one of the oldest and most potent in Western mythology. Apple’s use of the logo is extremely powerful; their name and the corresponding pictorial icon are synonymous: they both say apple. The simple logo design deftly carries the heft of centuries of meaning. Apple likes their symbol so much that they’re very protective of it, and they don’t like when other people attempt to use apples in their logos. Two examples of Apple logo trademark disputes are Apple versus New York City’s ‘GreeNYC’ logo and Apple versus Woolworths’ ‘apple-y’ logo. The Apple logo symbolizes our use of their computers to obtain knowledge and, ideally, enlighten the human race (when we’re not too busy using them to look at cat GIFs, that is). The forbidden fruit grants wisdom, just like Apple computers do. Of course, the sin of partaking in the tree of knowledge is also the original sin that accounts for the fall of man. If you’ve ever seen the Terminator movies, you know that technology will also be the fall of man! How appropriate. So, if the Bible doesn’t specify the fruit as an apple, how did the apple become a primary symbol of this creation myth? The most likely reason comes from fine art. The apple has historically been used as a standard symbol in visual depictions of the Garden of Eden (as seen above), and thus accounts for its place in our common knowledge of the Biblical creation story. It’s likely that painters initially chose the apple because of its prominence in Greek mythology, where it was already being used for very similar purposes. 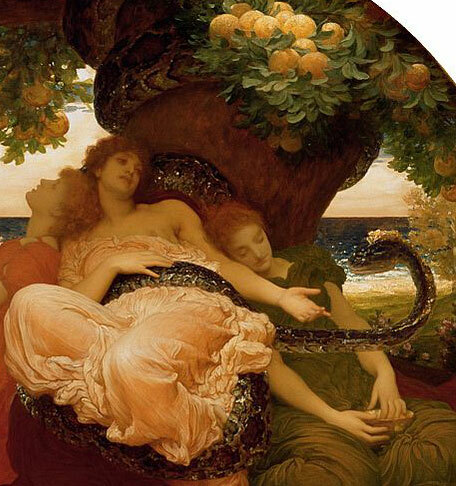 In Greek mythology, the ‘Hesperides’ are nymphs that reside in a garden of delight where golden apples grow. These apples grant immortality when eaten. The garden was also guarded by a hundred-headed dragon named Ladon, who never sleeps. Ladies in a garden, an evil beast, and an apple tree. Sound familiar? The similarities of these myths reveal a fundamental aspect of storytelling. It’s a natural human habit to borrow, reuse, and re-purpose familiar symbols, plot structures, and other narrative elements. For artists who had a preexisting association of apples with similar stories that had been told before the birth of Christ, it would have been natural to ascribe the same symbol into the Biblical creation tale. In short, apple symbolism is not only prominent in our most common version of the Biblical creation myth, but it predates that myth. Since the dawn of storytelling, man has used the apple to visually symbolize all manner of things, including knowledge, immortality, abundance, the fall of man, and more. It makes sense – the apple almost seems to epitomize the fundamental idea of fruit and even food itself. It’s a visually simple food – round, colorful, and almost elemental in its form. If you’re building a website, you might use an apple icon to simply represent a ‘food’ or ‘health’ category in the navigation. It’s such a primary symbol to us that we almost take the Apple logo meaning for granted. It was extremely savvy of Apple computers to harness such a potent symbol in both their brand name and logo. In doing so, they harnessed iconography that’s been around as long as we have. What Does The Nike Logo Mean?